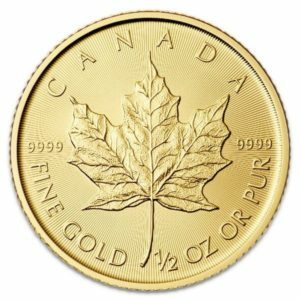 The Canadian Maple Leaf 1/2oz Gold Coin is a stunning gold coin and a fantastic choice for anyone looking to invest their money. Investing in gold coins is a very good choice right now during this time of economic uncertainty and choosing the Canadian Maple Leaf 1/2oz Gold Coin means picking something stunning and with guaranteed value. Read on to learn more about why this is such a great choice. When investing your money, it will normally be recommended that you make some high risk investments (which have potentially higher yield) and some lower risk investments. The reason we make these lower-risk investments, is so that we know our cash will be safe and that a sudden market-change isn’t going to leave us with nothing. Investing in gold offers you just such a safe and reliable investment. The reason for that is simple: gold is what the value of money is based on. It gets its value from its inherent short supply. And when you combine those two factors, it becomes instantly apparent that it would take more than a short-term market fluctuation to hurt its value in the long term. In fact, as markets become less reliable, a lot of people will choose to invest in gold for that very reason. This drives up demand and of course that increases the value. For this reason, investing in gold is actually only one of the ways that the value of your assets is likely to go up rather than to go down! And investing in gold coins makes even more sense. This way, you actually get to own the asset that you’re spending money on. This is not usually the case when you invest in gold bars, or in ETFs of gold mining equities for instance. But what that means, is that you don’t have to pay any fees for your gold to be stored and you don’t need to pay to ‘withdraw’ your property when you want to liquidate your assets. Investing in gold coins also means that you can start with a very low value, which makes it a suitable option for those with only a small amount of money to put away. And on top of all that, gold coins are beautiful. Actually getting to hold them in your hand is a privilege and one that you should not take lightly! And this is why choosing a stunning coin like the Canadian Maple Leaf 1/2oz Gold Coin is such a great idea. The Canadian Maple Leaf 1/2oz Gold Coin is what it says on the tin. On the front side, you get the classic image of a maple leaf, which is centrally positioned and brought to life in stunning detail. Each vein and wrinkle is in stark relief and this makes for quite an intricate and fascinating coin to examine. Along the top is the word ‘Canada’ and below it says ‘Fine Gold, 1 Oz or Pur’. The front of the coin meanwhile shows a younger looking Queen Elizabeth II, along with the legal tender value of $50. The image of the Queen shows her in portrait, looking to the right and is brought to life in a somewhat stylistic manner rather than hyperreal. The date of the printing will also be included on each coin. In short, this is a beautiful coin and a pleasure to own and handle. This coin is one of the most popular bullion gold coins around the world and it has been that way since it was first issued back in 1979. Today, it competes alongside the American gold buffalo and other top-selling coins. The coin comes in many sizes but this ½ oz is somewhat rarer. That makes it more desirable and an even smarter investment. The Canadian Maple Leaf 1/2oz Gold Coin will trade for a premium above the weight in gold, which is a testament to its collectible nature and the artistry designed in its design and creation. The printed value is symbolic. The coin is popular for a number of reasons. The design is one but what also makes it a hit is the fact that it is guaranteed in its weight and its purity by the Royal Canadian Mint, so you know exactly what you’re getting and have assurance that it will be accepted as standard worldwide. Dealers will publish daily buy and sell prices too, which makes it easier to trade.